November is Picture Book Month – a whole month to share and celebrate the awesomeness of the mighty picture book! The advent of ebooks changed the publishing landscape. In those early days, there was some concern about picture books: would they slowly disappear from bookshelves? Would readers prefer to access and read all books digitally, including picture books? While there are many advantages to electronic books, it soon became clear that for picture books the transition from the printed page to smart device screens came with a loss. Picture books are more than just text and illustrations -- and that makes all the difference. Reading picture books is a shared experience. They are meant to be read together, either one-on-one or as a read-aloud. The tactile experience of holding the book and turning the pages together is both nurturing and stimulating. A picture book can help us learn basic concepts, such as numbers, colors, and opposites. But picture books do so much more: they offer stories about love and loss, friendship and kindness, about grief and joy, fear and courage, about conflict and solutions – the list goes on. Pretty amazing when you consider that picture books have a standard size of only 32 pages! Great picture books are also works of art where the narrative is told through two different mediums—words and illustrations. They each carry the same weight, complementing and advancing the other. Everything matters in a picture book: trim size, type font, choice of media, endpapers – and all these elements shine in the print format. So what can you do to celebrate Picture Book Month with your little one(s)? Visit your neighborhood library for storytime. Check out picture books to read at home. Check out picture books to read on the bus or train. Read a picture book by an author or illustrator you know. Read a picture book by an author or illustrator you don’t know. Read a picture book biography. Read a book highlighted in the Picture Book Highlights series. Read a picture book that takes place in a different country. Please share with us in the comments what new picture books you’ve discovered—we would love to hear from you! And keep on reading picture books, like every month is picture book month! 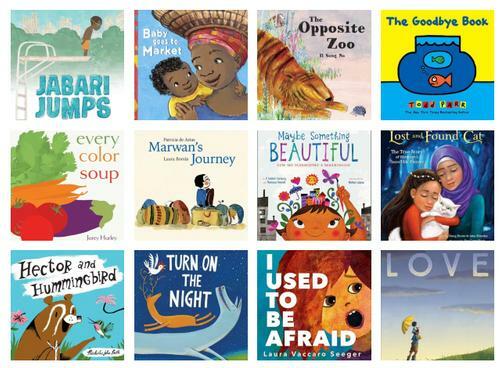 Check out these books and more in our catalog and at a neighborhood library near you during Picture Book Month! Add a Comment to November is Picture Book Month!